It’s Election Day. No sooner do you get one ballot in the mail, here’s another vying for your attention. It’s time to heed the call — for entries — and promote your picks for the 2012 James Beard Restaurant & Chef Awards. 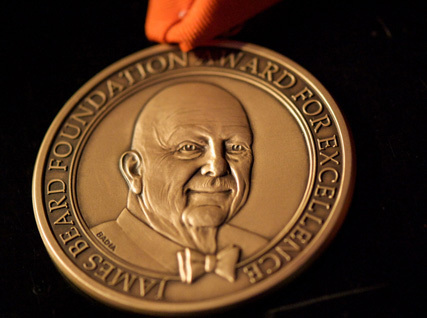 The Beard Foundation is once again calling all comers to submit the names of their favorite chefs and restaurants as contenders for a 2012 award. You have till December 31 to make your voice heard, but why procrastinate? Here’s the link, do it now. Finalists will be announced March 19. Winners will be revealed in NYC at a gala event May 7. New this year is a category for Outstanding Bar Program, with the award going to a restaurant or bar that demonstrates excellence in cocktails, spirits and/or beer service. National in scope, it’s given to the establishment, not an individual. While we’re on the subject, anyone care to comment on which local bar program deserves to be a contender on the national stage?